The big ships endured heavy losses last week extinguishing any hopes from the recent minor rally. Negative sentiment gained pace throughout the week, Cyclone Veronica developed in North-Western Australia prompting Port Hedland and Dampier to issue port closure notices, expected to last in-excess of 48 hours. Miners were largely absent through the latter part of the week, as route C5 traded sharply down to $5.00. Mid-week saw a short-lived bump in freight on South Africa/Qingdao tender cargo as the slim ballaster fleet showed signs of pressure points, with many reluctant to head west. The Atlantic basin, bereft of cargo, weakened in value throughout the week, as ballasters competed for business from Brazil and Colombia to the Continent. Vale announced the return of operations at the Brucutu mine in the next 72 hours. Physical spot rates continued to decline, although forward rates saw a bump in value across the curve to close out the week. There was a solid improvement in the Atlantic market this week driven mainly by activity for first half April from East Coast South America. With a shortening tonnage list, charterers have been forced to take tonnage from the Continent/Mediterranean to cover early stems, with rumours of a modern Kamsarmax fixing on subjects at $16,000 basis Gibraltar delivery, and multiple ships agreeing $15,250 plus $525,000 ballast bonus on an Arrival Pilot Station (APS) basis. Transatlantic trades also reaped the benefit, with the index rising more than the front haul rates. Ships were fixing close to $18,000 APS South America for redelivery Atlantic, where the previous week saw $11,500 concluded on similar business. The Pacific, in contrast, was flat at best, with a lack of Australian mineral cargoes splitting the market and making it very positional. Vessels open in the south had more options, with Indonesia remaining busy plus ballasting to South America an option. In the north, an active North Pacific market was insufficient to maintain rates, especially for tonnage open North China. The Baltic Supramax Index (BSI) gained ground during the week, with improved rates seen from key areas. 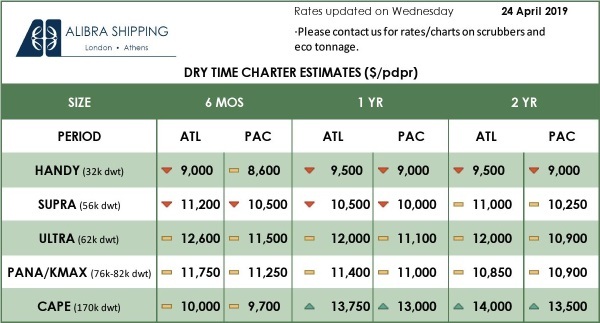 There was limited period activity, but a 60,600dwt ship open Damman was rumoured fixed for a short period at $12,750. The Atlantic had a mixed week, with little fresh enquiry from the East Mediterranean. From the US Gulf, congestion and high water saw vessels with reliable positions achieving good levels; a 56,000dwt vessel fixed for a trip to the East Mediterranean at $15,000. Increased activity from East Coast South America was evident, where a 55,000-tonner was booked to the West Mediterranean at $17,500. A 66,300dwt ship fixed for a trip to the Arabian Gulf at $14,400 plus $440,000 ballast bonus. Rates from Asia improved as a 56,800-tonner agreed delivery China to the Arabian Gulf, the trip was agreed at $8,150 for 45 days and $10,500 thereafter. It was a positive week for the Handysize market. East Coast South America saw strong demand, with very few prompt ships. As the week closed out, brokers suggested that cargoes were still to be covered. A coastal trip along East Coast South America paid in the $12,000s on a 34,000-tonner. On the period front, a similar-sized vessel was paid $10,750 for four to six months from Recalada, with redelivery in the Atlantic. From the US Gulf, a 36,000dwt vessel agreed $9,400 basis South West Passage for about three to five months, redelivery also within the Atlantic, and a single trip from the area was concluded at $9,000 with grains to East Coast Mexico. Otherwise, $6,000 reportedly fixed on small Handysize vessel from Skaw to East Coast South America and $5,000 for inter-Mediterranean trips. 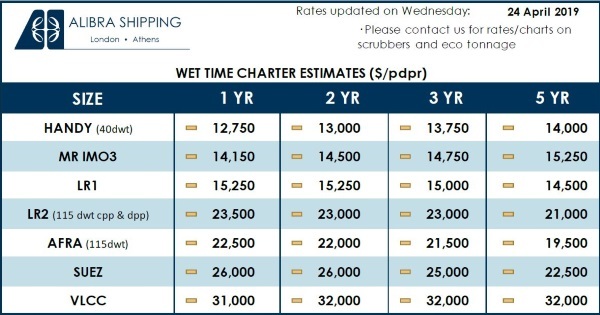 In the East, a 33,000dwt ship and a 28,000dwt ship, both open in the Philippines, were booked for a run via West Australia at $7,500 redelivery in the Far East and $7,100 redelivery West Coast India respectively. A coal trip from Indonesia paid $9,500 on a 39,000-tonner basis delivery Kuantan to China.